Over the past months we’ve been hard at work building a new version of Pidoco to create an even better experience for you. Many of you have helped us by participating in several rounds of usability tests. After incorporating your feedback into our design, here’s the result: a new Pidoco version that we are certain you will love. In order to ensure an optimal usability, the new Pidoco now greets users with a clean new design providing a clear overview and facilitating access to all core functions. The Home screen is now fully integrated with the other views and syncs easily with the editor while you are working on your projects. We’ve also extended the breadcrumb navigation to the Home view and improved access to support options as well as account and license information. In addition, we have polished the preview, our dialogs, and the sidebar in the editor to make them easier to use. 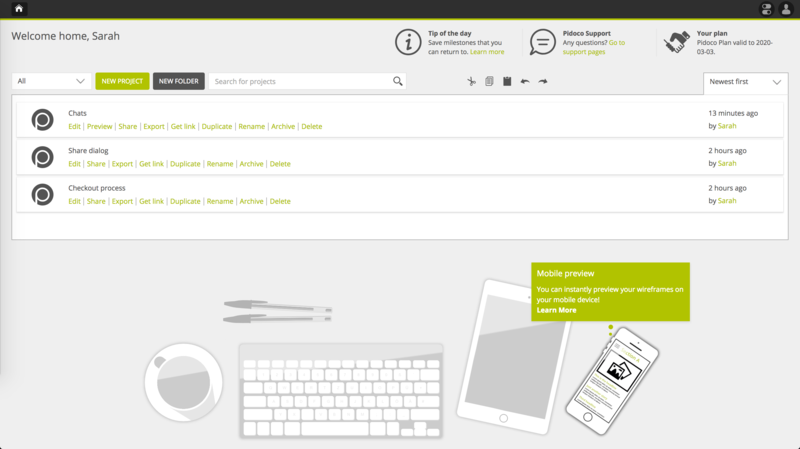 The new home screen has been redesigned and now offers quick access to frequently used functions. One of the most noticeable changes is the brand-new Map feature. Instead of a simple list of screens, the first thing you see upon opening a project is a complete overview of all its screens in the form of a screen map. Aside from a thumbnail depiction of each screen the map shows you the links between pages, giving you a quick insight into the structure of your project. Simply drag your pages to individually reposition them. The map comes complete with zoom and scroll functions, just like you would expect. 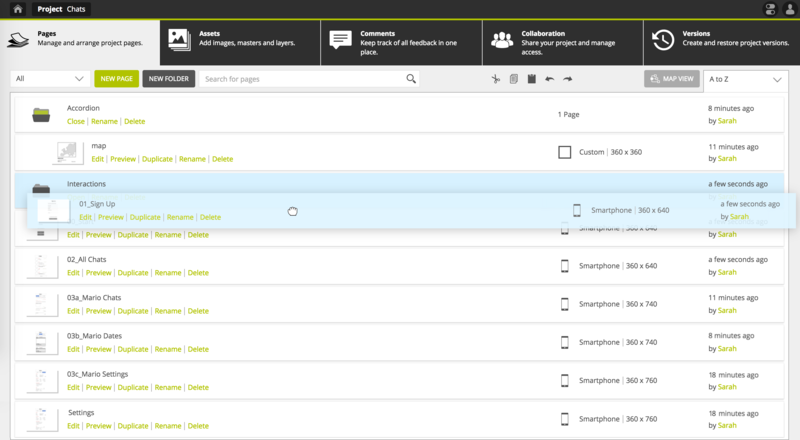 Of course you can still switch back to the traditional list view, where you can organize your pages in folders. The new Map view gives a great overview of the project. Projects can at times become quite complex. 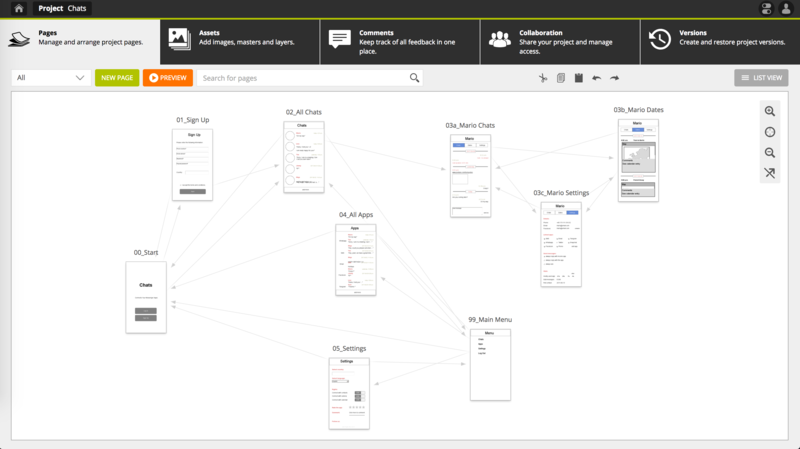 The improved Project view offers easy access to all the components of your projects. Five main tabs conveniently structure your project and let you jump directly to screens or assets, manage access, review or reply to comments, and save project versions. In addition, we introduced Quick Actions for each element, offering frequent actions such as editing, simulating, exporting and sharing of projects or editing pages at the tips of your fingers at any time. The improved project view provides easy access to all parts of the prototype in the five main tabs. 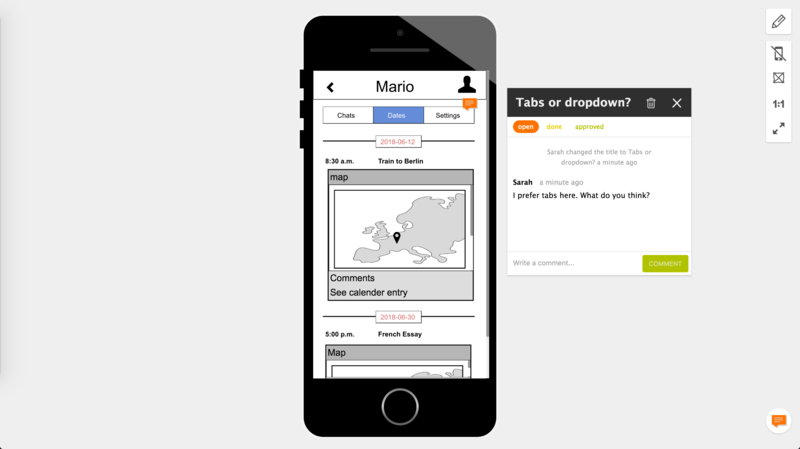 From projects to pages, assets and comments, we have re-designed how elements are displayed. A unified list pattern provides an easy-to-grasp overview of projects, screens and assets while search, sort and filter functions allow you to optimize how you work. Sorting refers to element name, creation date or last edit, while filters are available for screen sizes or asset types, depending on the type of element. The Quick Search works like a dynamic filter and is now available in all views, from stencil palette to screen list. Just start typing wherever you are to find what you are looking for. In addition, we have standardized editing options across all views to speed up your workflow and keep things as simple as possible. Finally, you will find convenient meta information on many elements, which will help you find what you are looking for. While this is not a new feature in Pidoco, we have vastly improved the drag & drop upload. Previously available for images, we have now expanded this helpful feature to entire screens: Simply drop a screenshot onto the Map or screen list and Pidoco will automatically create a new screen in the right size and add it to your project with the uploaded screenshot placed as background image, so you can immediately start editing or linking that screen. Additionally, we have rolled out drag & drop in all views, so you can now sort and move elements easily. Drag your pages or assets to organize them in folders. Commenting has been a core collaboration feature of Pidoco from the start. Now we have incorporated a new Comments panel into the main editing view to offer better access to comments while editing a project. Comments are now also color-coded so you can see more easily which issues have already been resolved and which still require your attention. The redesigned sidebar in the editor includes a comment panel for quickly accessing all comments while editing the prototype. Collaboration is at the heart of Pidoco: You can share your projects with any person for viewing, commenting, forking or editing. We have improved the sharing mechanism, now you can easily retrieve the sharing link and share it with colleagues or clients without having to use the standard email option. The preview has received a new design as well. But even more important, we have added a full-screen viewing mode to allow you to present your prototypes in the best light. The comment markers now come in different colors, allowing you to recognize their respective status without having to open them first. 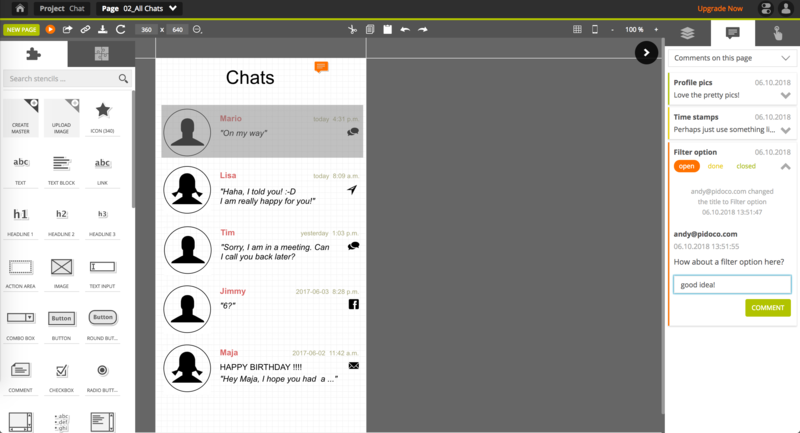 With its new design, the preview shows the prototype in action and has been equipped with a new full-screen mode. Of course, there are also a bunch of small improvements we have made, including better access to settings and profile information or new dialogs, but see for yourself: See the new Pidoco in action! Let us know in the comments what you think or email us at support@pidoco.com.